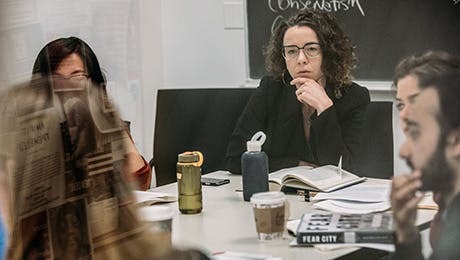 The 30-credit Creative Publishing and Critical Journalism MA program is centered on a set of core courses, which students are encouraged to complement with a choice of electives in The New School's other renowned graduate programs. Our graduates pursue a wide variety of writing and media careers, and some choose to pursue a PhD program at The New School for Social Research or other top universities. A full account of degree requirements and procedures is contained in the Creative Publishing and Critical Journalism student handbook. To earn the MA in Creative Publishing and Critical Journalism, a student must complete a total of 30 credits with a minimum grade point average of 3.0. A student may complete the program in one year by taking 15 credits a semester or may elect to complete the program at a slower pace or part-time. Anyone wishing to finish in one year should state that intention at the start of the first semester and plan a course of study with program faculty. Students must consult with one of the the department's program directors for approval of an individual path of study. A maximum of three credits taken at another university can be applied toward the credit requirement for the master's degree. The candidate must complete 27 credits at The New School for Social Research. Forms for requesting transfer of credit are available in the University Records Office. In addition to meeting the requirements described above, the candidate for the continuing MA will normally complete an individual capstone project, usually elaborated in the context of the Multimedia Publishing, Production, and Writing Lab, which may consist of a final piece of criticism, reflective essay, news article, example of design work, or portfolio that documents editorial or production work done in the program.